Shopping can be a lot like baseball, you know. Sometimes you strike out. And sometimes you hit a home run. And sometimes you hit that home run without even trying. To do that takes one talented shopper. Or a very lucky one. Or one who has a secret, or maybe not-so-secret, batting technique, if you’ll excuse the strangled metaphor. If I am very lucky in my shopping ventures, it’s usually due to hard slog: lots of preparation, wardrobe assessment, research, and then tramping around to a million stores to find out what I want. Or… it’s because I arrange to go visit my friend Liz, for lunch or coffee at Nordstrom, and she says she has something to show me that I might like. And I do, and it comes home with me. Wham. Home run without even trying. That’s what happened the other day. What I wore on my lunch date aka accidental shopping adventure. Veronica Beard jacket, Burberry denim skirt, Vince tee, Michael Kors bag, Stan Smith Adidas. I met Liz for lunch at Nordstrom, and she said there was something she wanted to show me, after we’d eaten. A jacket she’d pulled for me from the summer sale rack. No pressure. But it was on sale at a great price, and she thought it might be something I’d like. Ha. I did. I loved it. She knows me so well. And she knows my wardrobe. And. And this is the really great part. She said it would probably be marked down again. So we waited. And, in the final analysis, it was on sale for more than 50% off. And I went in again to pick it up. Yah! That was the easiest shopping home run I’ve ever hit. Eventually I came home with this gorgeous navy Moncler baseball jacket. Hence the baseball metaphor. Actually, Moncler calls this the “Maglia cardigan.” But it looks like a baseball jacket, with a zippered front closure and zippered pockets. The sleeves are nice and long, but I like them pushed up anyway. 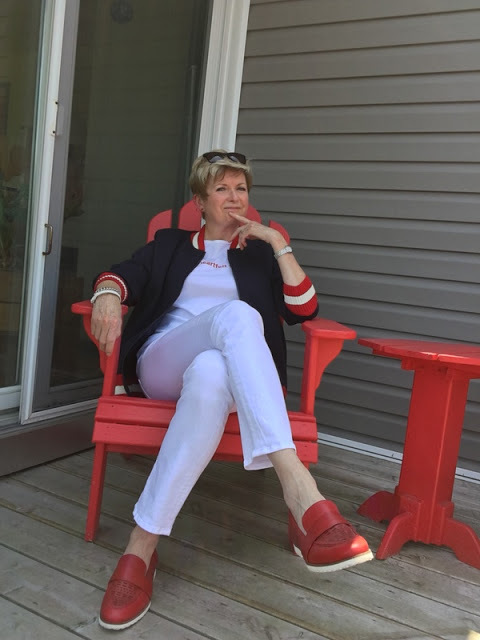 I love my new jacket with my white Frame straight leg jeans, my white and red message tee from Zara, and my red Earth brand loafers. It also looks good with a striped tee, a navy tee, a red tee, or a plain white tee. If I were wearing blue jeans with the jacket, I’d probably wear the plain white tee, or the red one, and sneakers. The jacket also looks great with my Burberry denim skirt, and a tee shirt and sneakers, the same outfit I wore to shop that day, except with my new jacket instead of my Veronica Beard blazer. I plan to try it with my newly refurbished Max Mara wide-leg pants, as well. The jacket is the perfect length to cover what needs to be covered. The sleeves are long enough for me, which is not always the case. You can see the line of the back here in this shot. It’s not puffy like jackets of this style can sometimes be. Trust me, I do NOT need any more puff around the middle. I like the fit and the cut of this jacket. I’m wearing a size large. And it’s really easy to style. An outfit home run every time without even trying. I think the red loafers and the red and white striped trim on the jacket do all the heavy lifting when it comes to accessorizing. So I’d probably not even bother to carry a bag with this outfit. The jacket has roomy enough pockets for my car keys, a credit card and my phone. I didn’t go looking for this jacket. In fact, it wasn’t even on my radar. 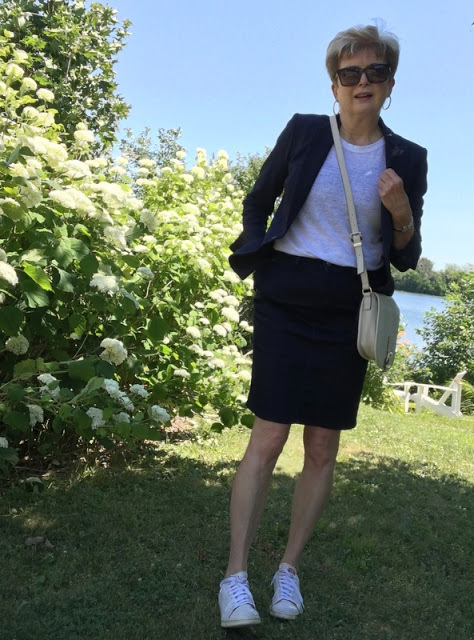 But, it fits so perfectly into my wardrobe, with my jeans, and skirts, and dress pants, and with my loafers and sneakers, it works so well with all of my navy pieces, and with the red accents I’ve been wearing this spring and summer, that I consider buying it a wise shopping move. I’m pretty pleased with my home run, I must say. If you’ve been reading my blog for a while you’ll know that I have a very defined shopping philosophy. All about knowing what looks good on me, knowing exactly what I already own, and what I need to fit in with what I already own. I wrote about my “shopping rules” over at Brenda’s blog 1010 Park Place last week. You can read that post here if you’re interested. One of my rules is all about getting good advice. Having coffee with Liz at Nordstrom e-bar the other day. As I’ve said many times here, my friend Liz is the personal shopper at Nordstrom. With her knowledge of fashion and of her merchandise, her understanding of me, my style, and my wardrobe, she is my secret shopping weapon. I don’t understand why more women don’t take advantage of some of the talented people who work in retail. By that I mean seeking out a shopping advisor, like Liz. Seriously, you should get out there and find your own Liz, wherever you live. Whether they are a personal shopper, or a skilled sales clerk, they need to be someone who knows clothes, knows their merchandise, and is willing to build a relationship with their clients. It might take a few tries until you find someone who suits you, but it is sooo worth the effort. Now I have to go and do my fall shopping research. It feels a bit scandalous to be thinking of shopping again, after so recent a purchase. But the Anniversary Sale is coming up, and my sister and I will be charging into the melee, hoping to see something we love on sale for fall. I’ll be looking for travel pieces. And maybe a skirt. I don’t own any fall skirts. Maybe knee high boots, if I find a skirt. But, ultimately, it will depend on what’s on offer. We’ll see if we hit any home runs. Or strike out altogether, and just go for lunch. I’m happy either way. I’ve learned that navigating the Anniversary Sale is all about not having too many expectations. D’uh. Of course, you knew that already. Now, how about you my friends? Have you hit any shopping home runs lately? Brava for you and for Liz as well! Thanks, Dottoressa. I hope to get lots of wear out of it. Oh… btw… we watched the World Cup Final. A valiant effort from Croatia! Thank you very much-I'm so proud! Such a good picture of you and Liz, as well. Ha. I didn't know I needed it, but turns out to be just the thing to pull everything together. I can't wear my Veronica Beard jacket all the time! Did you show that bag on IG??? PS – what is an Anniversary Sale? She is talking about the Anniversay Sale held this time every year at Nordstrom. Usually fall merchandise marked down during the sale. All new merchandise that is then marked up after the sale is over. Anonymous is correct. I didn't know what the Anniversary Sale was until Nordstrom came to Ottawa. I should have defined it better in my post. I think the biggest draw is not that it's a sale, but that it's next season's items. It's great if you can get your head around fall in July. I didn't make it into a John Lewis when I was in London last fall. Now I wish I'd tried harder. That myth must be something like Holly Golightly's view of Tiffany's. She is a great friend. I've introduced her to many of my other friends and she works just as hard to help them dress the way they want. I'm so jealous of that jacket! It looks great on you. I've loved my two items I ordered from M&S. They were in my M&S post. It's too hot and summery for them at the moment but definite reasonable priced after 50% off hits. I think M&S must have undergone an image change. When they had a store here in Ottawa in the eighties, it had an "old lady" reputation. But my suede moto jacket from M&S that I won on That's Not My Age is very with it. ooh, love that jacket! you will get so much use from that piece. i have a shopping home run to relate but it was my daughter who hit it. she found a gorgeous grey sweater at nordstrom rack in denver reduced from $338 to $70. when she got to the register it rang up for $.01. yes, one u.s. penny. the sales clerk told her that when stuff doesn't sell at a certain price point it is shipped elsewhere to a discounter. if an item falls through the cracks and doesn't get shipped away, it rings up at $.01. boy, was she thrilled. Wow. That is spectacular luck, isn't it? You rock in your new coat. What a fun addition to your wardrobe! Liz knows you well. I guess my Aritza slacks are my latest success and I've worn them a lot ….now, only if I could find the right sandal or shoes to complete the look! I have a size 6, narrow, slender foot….difficult to fit a dressy sandal or shoe too! Oh… I hear you, Robin. I have narrow feet too, and very few shoes fit me… that is if I don't want to walk right out of them. I love that jacket and have been looking at it. I think it would look fabulous with a skirt too, longish and sneakers. Great purchase. I'm trying to be more organized in my shopping and do find, that when I go to an actual store rather than ordering online, I do find better things. I think it would look great with a longer skirt too, Kathy. That jacket is great on you. And BTW, you look fantastic in both the denim skirt and the straight white jeans. I had not realized that a personal shopper was available to everyone. I thought it was for the big budget people and you just had a personal friend (Liz) who happened to be in the biz. So thanks for that! Yep. I think that many people believe that personal shoppers are just for the elite. I've sent several friends to Liz and they are alwyas really happy with their purchases. 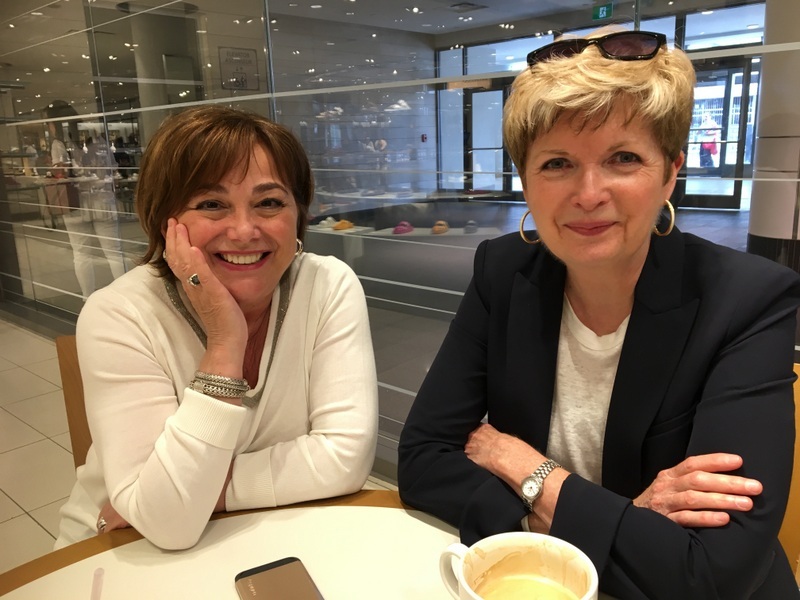 I met Liz when she was working on the floor at Holt Renfrew. When she was promoted to personal shopper, I just went with her. Before that I would never had dared tried to work with a personal shopper. That jacket is FABULOUS on you! It's one of those not-so-basic-basics that really personalizes a wardrobe. Thanks, Sue. A not-so-basic basic… I like that. Thanks, Alayne. I've seen some really great black and white jackets this season. That is one terrific jacket, but if you're wearing a large, what hope do the rest of has have? I think that Italian jackets are quite small. Plus I have broad shoulders, and am very broad across my upper back. So don't be fooled… I'm bigger than I might appear. What a great jacket and looks perfect with your other red bits. You are going to get a lot of wear out of it. Thanks, Christy. I think once the weather cools a bit, I'll wear it well into the fall. That is an incredibly fabulous jacket and wonderful friend. What a great find. Thanks, Kim. Liz is great. Well I love the jacket on you Susan. The red stripes and the white column dressing lend itself really well to the style, as do your red loafers! very smart. I had a few shopping home runs at Zara this past season, but may be holding back a bit for Fall clothing once I see what is 'needed' in my wardrobe. I have had a hard time psyching myself up for the Nordstrom sale in July. It feels way too early to be thinking about fall. As it happens I went to the pre-sale yesterday, and struck out entirely. I love a shopping home run! Especially when it's a Moncler baseball jacket! Adorable on you …. everyone needs a Liz!! I am thinking about to find a personal shopper from many days. I get to know they are so much beneficial. By them i could save my money and time both. I was go through many problem from many days so did not give time on my shop. I think personal shopper could help me in this situation.